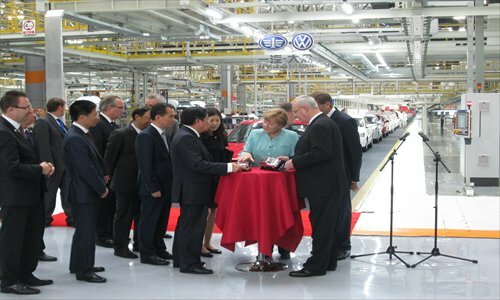 China and Germany signed a series of trade and investment deals on Monday during a visit to China by Chancellor Angela Merkel, including agreements on two new Volkswagen factories and the sale of 123 Airbus helicopters. 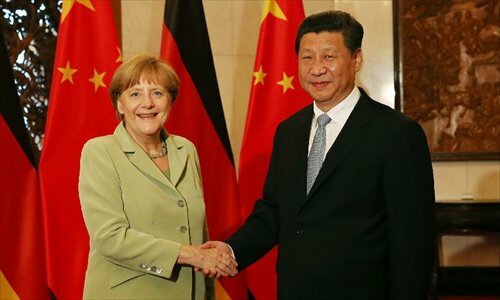 Chinese President Xi Jinping met with German Chancellor Angela Merkel here on Monday and pledged to cement the strategic partnership between the two countries. 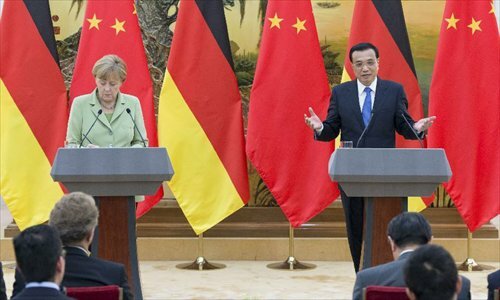 Chinese Premier Li Keqiang said Monday that China is willing to promote China-Germany ties to new progress in the spirit of mutual respect and mutual benefit. 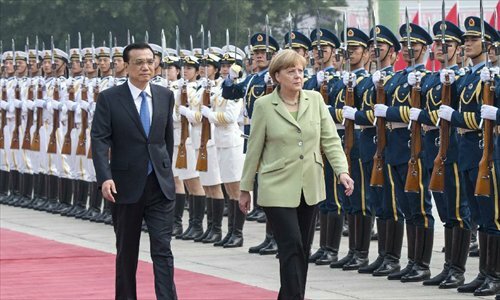 Chinese Premier Li Keqiang (L) holds a welcoming ceremony for German Chancellor Angela Merkel in Beijing, capital of China, July 7, 2014. 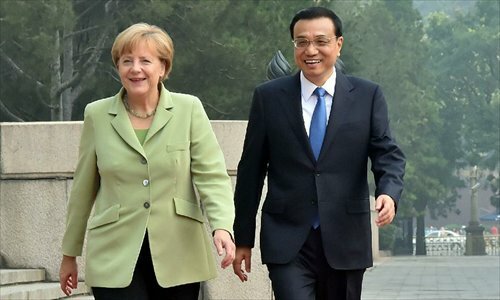 Chinese Premier Li Keqiang (R) holds talks with visiting German Chancellor Angela Merkel in Beijing, capital of China, July 7, 2014. 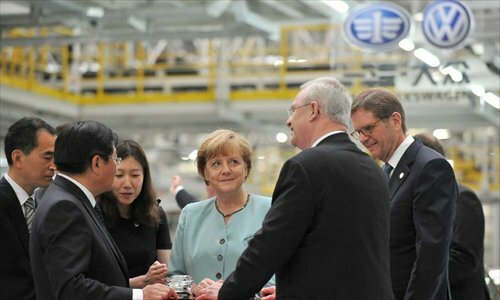 German Chancellor Angela Merkel (C) visits the branch company of FAW-Volkswagen in Chengdu, capital of southwest China's Sichuan Province, July 6, 2014. 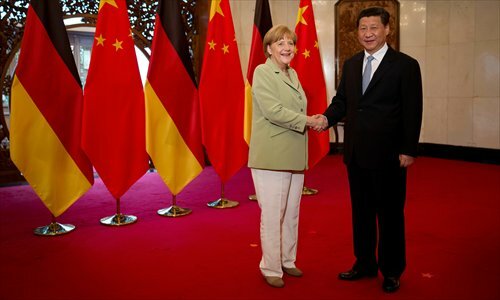 Merkel is on her seventh China visit as chancellor from July 6 to 8. German carmaker Volkswagen will bring more new energy vehicles (NEV) to China in the next few years, but mainly plug-in hybrids, President and CEO of Volkswagen Group China Jochem Heizmann said in an interview over the weekend. German Chancellor Angela Merkel Sunday arrived in Beijing for political talks with Chinese leaders following a one-day visit to Chengdu, capital of Southwest China’s Sichuan Province, to tap business potential for German firms in western China. Merkel earned applause from China last year for her opposition to the EU trade investigation into Chinese mobile telecommunication equipments. The unusual co-action between the two exporting powerhouses is deeply rooted in their economic complementarity. Merkel's seventh visit shows that Germany recognizes China's contributions to the world, as well as the importance of bilateral economic cooperation. China needs urbanization and industrialization to develop its western regions, and Germany has the edge in these sectors. More in-depth cooperation can be expected in fields such as environmental protection, new energy and finance. Choosing a city besides the capital for Merkel's first stop indicated a close relations between China and Germany. 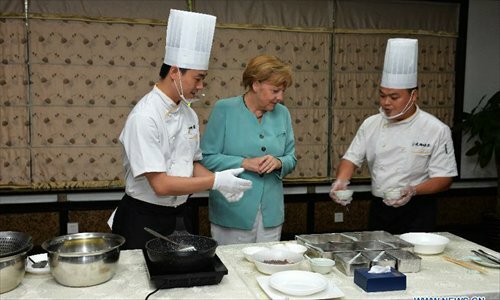 Merkel, who is a frequent visitor to China, wants to better understand the country by visiting other places. Also, the Chengdu visit also implies that Germany seeks to further develop trade in southwest China.